I hadn’t heard of anything edible being made from prickly, stinging nettles until my first spring in Sweden. My mother-in-law served nettle soup for lunch one day and I loved it. Now I look forward to it every spring and this year I asked her to show me how to make it so I could share the recipe. Nässelsoppa (NEHS-suhl-SOH-puh) is well-known in Sweden although not many people make it these days. Hard-boiled eggs and crème fraiche are the traditional accompaniment. Perfect for using up all of those Easter eggs. Every spring my mother-in-law gathers the stinging nettles that sprout in the patch of woods just behind her house. 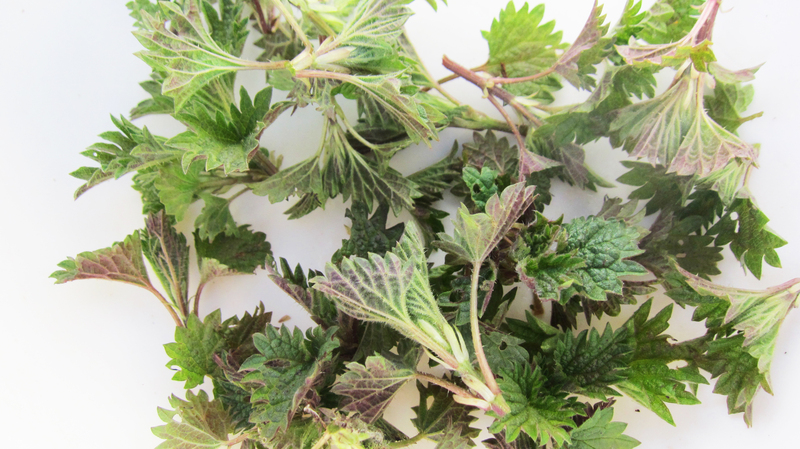 Early nettles are tender and perfect for cooking. Even though the shoots are small they’re still prickly little devils that can cause a stinging rash unless you wear gloves to avoid the tiny hairs that cover the plant. Packed with nutrition and flavor they have high quantities of iron, calcium, vitamin A and K. In medieval Europe they were used medicinally as a diuretic and to treat joint pain. Once the nettles are a foot high (30cm) they become fibrous and tough. But if you are “lucky” to have a patch of nettles nearby (never thought I’d use the word lucky in conjunction with stinging nettles), you can cut them back and get another growth of tender shoots. You can also freeze the whole shoots for future use. I didn’t realize how many recipes there are and how many cultures use nettles in cooking until I started looking around the web. One of the best collections of recipes I found is at the Fat of the Land blog. 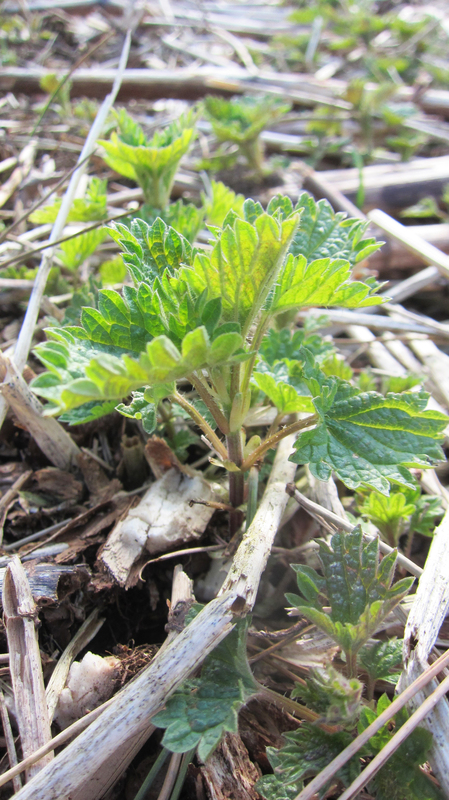 Check it out if you are a nettle enthusiast and you want to do more with them. 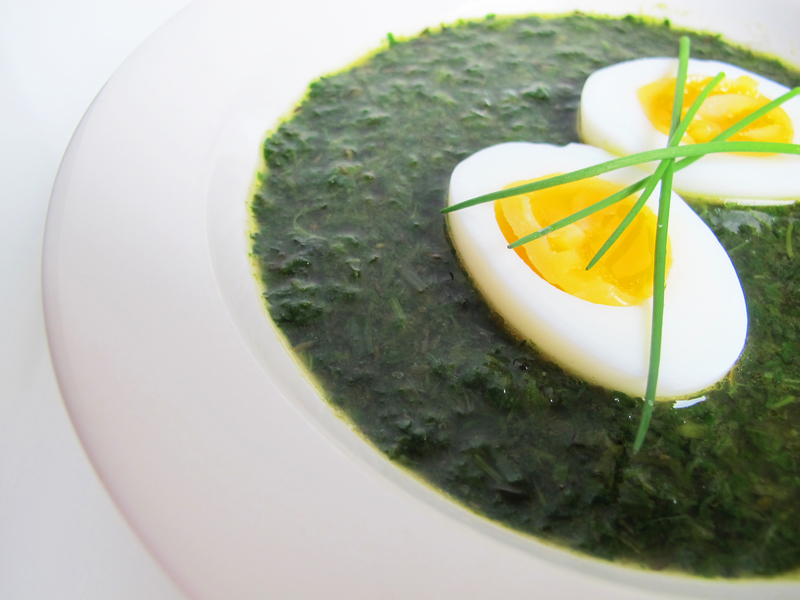 But for now, here’s a classic Swedish nettle soup. 1. 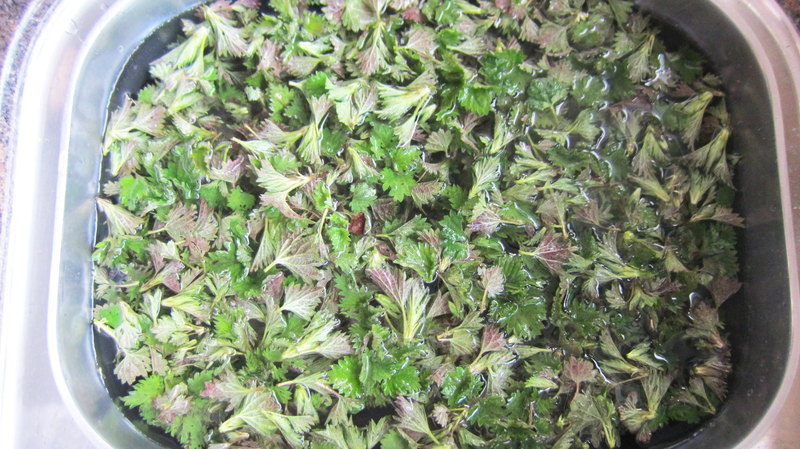 Rinse the nettles well by swishing them around in a sink of cold water and letting them float for a couple of minutes so any dirt will sink to the bottom. They will still sting at this stage so work carefully. Gently remove the nettles from the water trying not to disturb dirt in the bottom and keep an eye out for any unwanted bugs that need to be removed. 2. Place the nettles in a 2 quart (2 liter) stock pot. Add 1 cup (240ml) water and sprinkle 1 teaspoon of salt over the top of the nettles. Cover and bring to a boil. Reduce heat to a low boil and let the nettles cook for 5-10 minutes. If you are comfortable with the cleanliness of your nettles, strain off the cooking water and save it, pressing gently on the nettles to release more of their liquid. Otherwise discard the cooking water. 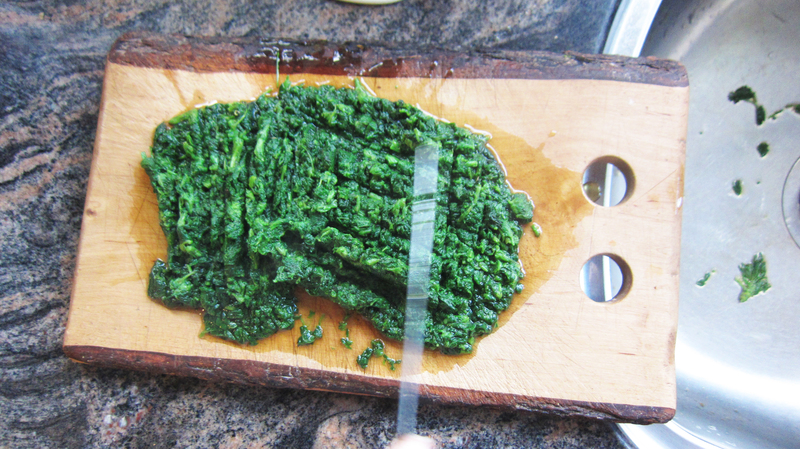 Place the cooked nettles on a cutting board. 3. Melt the butter in the same stock pot over medium heat. 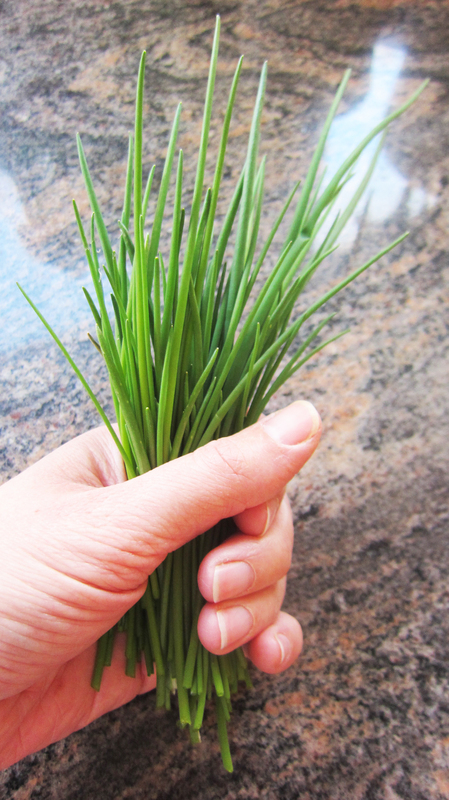 Add the chives and cook 1-2 minutes. Crumble the bullion cubes into the mix, breaking them up and stirring to dissolve them into the butter. 4. Chop the cooked nettles on the cutting board by hacking them vertically, horizontally, and diagonally both ways, with a chef’s knife until you reach the desired consistency. They can be coarse or very finely chopped. Add them to the stock pot along with the remaining water (3 1/2 cups if using the water reserved from cooking the nettles or 4 1/2 cups if the nettle cooking liquid was discarded), thyme, and white pepper. Sprinkle the cornstarch over the pot while mixing constantly. Bring to a boil and cook until the soup thickens slightly. Serve hot with halved hard-boiled eggs for garnish. Provide crème fraiche alongside. *If the instructions for your bullion cubes say they only make 1 cup (240ml) of broth, use two of them. I would have never dreamed of eating a nettle. I’ve been stung by them many times, espeically when I was teaching at Girl Scout Camp. I just might have to see if I can find a patch this spring. Nässelsoppa, oh vad gott, (yummy)! It Neems nettles and Rose Hip, tricky to touch are both good source of Vitamin C! Nettle powder good to boost health in many ways. Remember my niece’s Ponies like to chew on Nettles! Good to use dried as herbal tea or soaked in water to water the plants, as a natural pesticide. I’ve never tried nettle tea, but have heard good things about it. Thanks for sharing that link. I did a double-take the first time I read you can eat stinging nettles. I’d be curious to try, we’ll see if I ever find any–they’re not stocked at our grocery store, ha. How interesting. 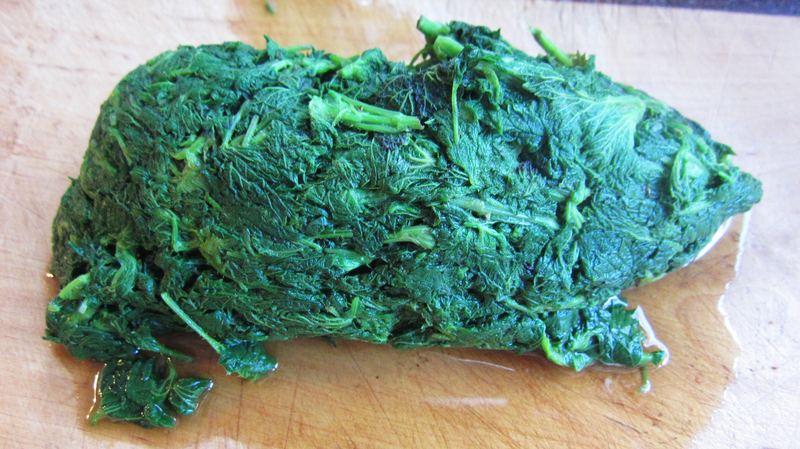 We had lots of nettles on the farm in Canada, it would have been useful to know you can cook them. Do the stinging hairs numb your mouth as you eat the soup or does cooking them diffuse the sting? Once they are cooked they don’t sting at all. It’s so amazing when you learn that something you thought was just a nuisance is actually tasty AND good for you! That is a great tip! Many thanks for passing it along.